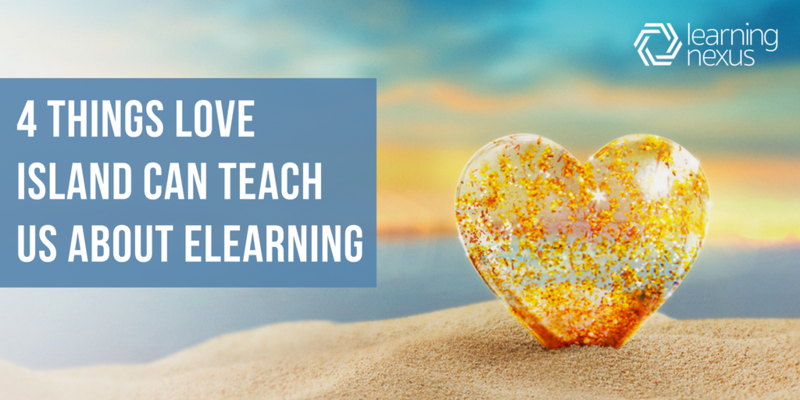 4 things Love Island can teach us about eLearning - Learning Nexus Ltd. Many Brits will be mourning the loss of Love Island today. It’s taken the UK (and world) by storm, with the reality show format being sold to at least 7 countries so far. Many Brits will also be celebrating the end of this year’s series.. Either way, the show’s huge impact on pop culture has led us to highlight few similarities between the hotly debated programme and the eLearning industry. Love Island wouldn’t work as a programme if all the personalities were the same. You need some fiery characters and timid ones to create drama and variety. Think Alex and Alexandra, or (new) Jack and (old) Laura. The same goes for eLearning. You can’t have one type of learning style for your users. They will get bored and you won’t see positive engagement. Most modern learning management systems support blended learning, like Totara Learn. This allows you to provide users with online and face-to-face learning. For example, put users through a traditional fire safety eLearning course, but follow it up with a practical face to face session. Maybe add in some fun video content on the same topic to reinforce learning points. Many of the Love Island contestants went into the villa thinking they knew what they were looking for. Nine times out of ten, their ‘type on paper’ doesn’t actually work in reality and they end up opting for a completely different person. We think the same can be said for searching for a new LMS in the eLearning industry. Many clients come to us with very strict guidelines on what they need from an LMS. It’s not until we sit down with customers and thoroughly go through their L&D goals and objectives that they realise what they truly need from a platform. Our advice? Use third party websites to read reviews about different learning management systems. Capterra or eLearning Industry are a good place to start and they often generate “Top 20” lists to help you whittle down the top players. There’s no doubt about it when we say that Love Island revolves around looks and beauty. Whether you like it or not, the appearance of contestants remains a constant factor throughout the show. Having said that, those who are deemed most attractive haven’t always made it down the path of happiness to true love. In the eLearning industry, many organisations put emphasis on how their eLearning or learning management systems look. They want it to be beautiful and reflect their branding. And why not? That is key to ensuring your learners have a consistent user experience and associate learning with your organisation. However, what is extremely important to remember is it’s not ALL about looks. You could have the most beautifully designed LMS with bells and whistles, but if it doesn’t function in the way you need it to, you are back to square one. Make sure when searching for a learning management system (or eLearning content) that you keep appearance and design in mind, but remember it’s the content that matters most. You want high quality learning content for your eLearning. You want highly functional features on your LMS that will save you time, effort and money. If you’re a Love Island fan, you’ll know that the best part of the week is when the producers get the contestants to play a game. Whether it’s a dancing competition or looking after plastic baby dolls, the game section get the highest response from fans on social media. Engagement sky-rockets on Twitter as they watch the contestants making fools of themselves on national TV. If you are researching a bespoke eLearning project but haven’t considered gamification, take a look at our Safran Landing Systems case study to highlight the benefits. So, there we have it. A few reflections to take away after another series of the ever-popular Love Island show. Who would have thought there were similarities to a bunch of single millennials and learning and development?! We hope you found our blog amusing and interesting! If you have any queries or questions, don’t hesitate to contact us through our contact form.